Traveling with your toddler for long distance is not simple. However, by taking your time to plan, your trip will be more comfortable and smooth. Whenever you are traveling for a long distance whether, by air, road, or rail, a baby car seat is crucial. Today, many parents have started realizing placing their kids on the lap is not only tiring but also keeps the baby in harm’s way in case of an accident. Fortunately, many airplanes allow the mother to carry a car seat to fasten the baby. 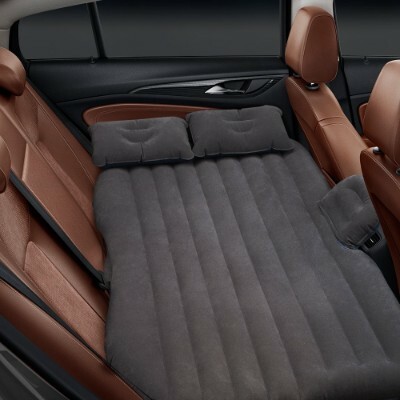 However, without the car seat travel bags, carrying these seats can be hectic. 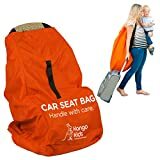 The best car seat travel bags will help you to keep the car seat free baby mess, making your travel more comfortable. 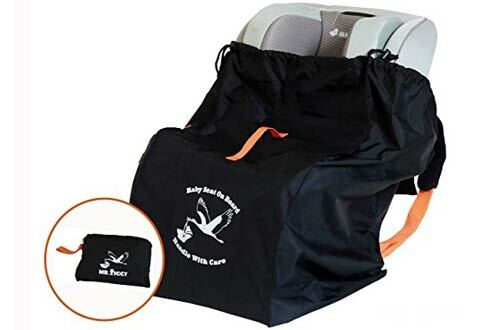 These car seat travel bags also come with adjustable straps that make carrying the car seat convenient. 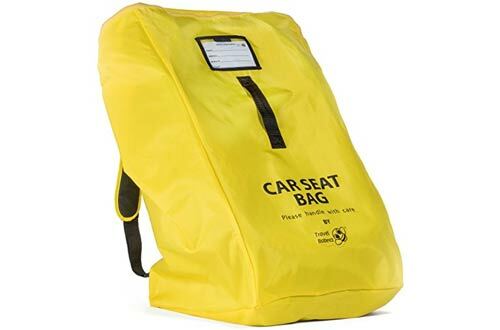 In addition, these car travel bags are acceptable in most airlines, so you don’t have to worry extra baggage charges. We believe that you deserve the best. For this reason, we have handpicked only the best car seat travel bags models from the countless products on the market. The entire model listed in our guide is crafted to hold various car seat shape and sizes. 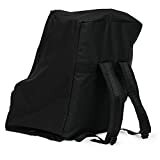 Therefore, you can be certain to get the best car seat travel bags you need. If you are looking for a brightly colored car seat travel bag, you will love this model from J.L Childress. Featuring an all round padded interior and a custom fit that ensures the protection of the car seat’s safety features, this model will allow you to carry your child luggage properly all the time. We love the ergonomic and adjustable harness style backpack that ensures a hands-free convenience. When you are planning for long travel whether, by air or road, you need to ensure that your child is fully protected. However, after long travel you may find that the kids travel seat is wet or filthy. 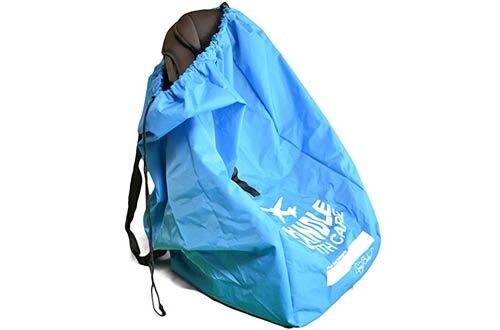 You can make sure that your child travels safely with this travel bag from Travel Babeez. 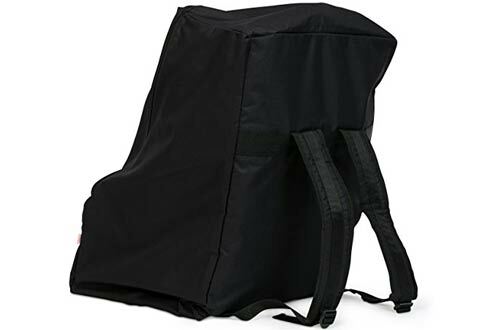 This bag is made from tear resistant ballistic nylon, which is more durable than the regular polyester version. 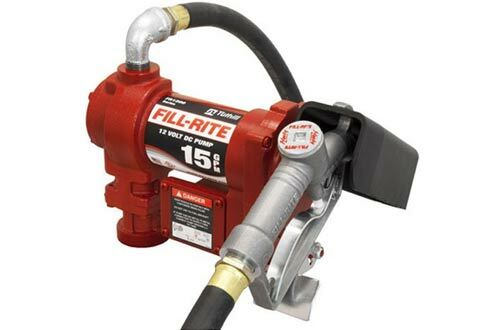 Besides, its backpack-style convenience makes it easier to carry. When traveling on a train, plane, or boat, you are familiar with the struggle that you face when traveling with your toddler. Without the right car seat, it can be hard to balance your luggage while still keeping your kid comfortable. This is the reason you need to purchase the Zohzo car seat backpack. 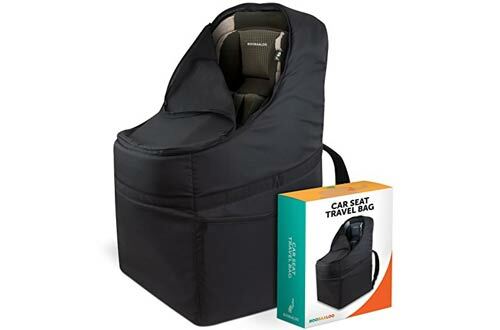 This car seat comes with a convenient and comfortable design that ensures that both you and your kid have peace of mind when traveling for a long distance. 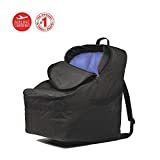 The Baby Caboodle travel bag is your best travel secret when you are looking for a convenient travel bag for air travel. Well, the manufacturer understands how hectic it can be to travel by air with your kid. Most of the travel bags are not accepted by the airline because of their design and sizes. However, you can now travel with the comfort with this travel bag. Besides, we love the backpack straps that enables a hands-free carrying. 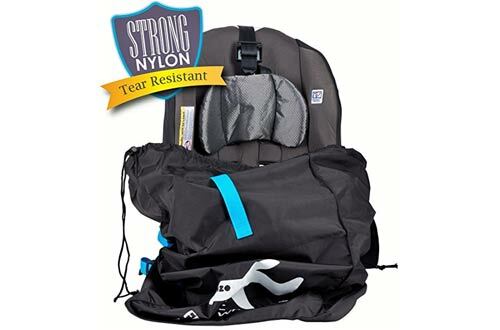 You don’t have to worry again about your kid’s safety with this travel bag. 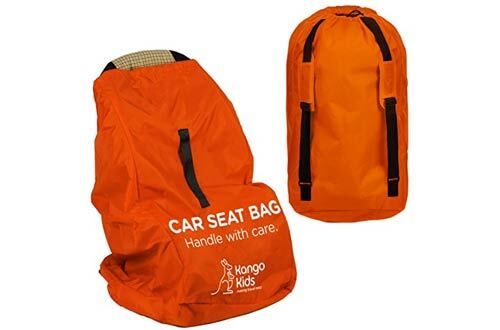 This bag ensures that your kid’s car seat remains in top condition all the time. This allows you to focus on how you can have fun rather than constantly checking to make sure your child is comfortable. With this unit, you can also free up your hands in busy airports thanks to the two adjustable shoulder straps that make it easy to carry. 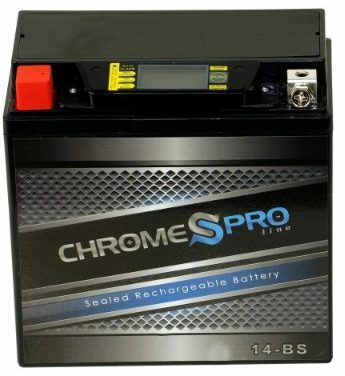 Besides, this unit is compatible with most car seat brands. 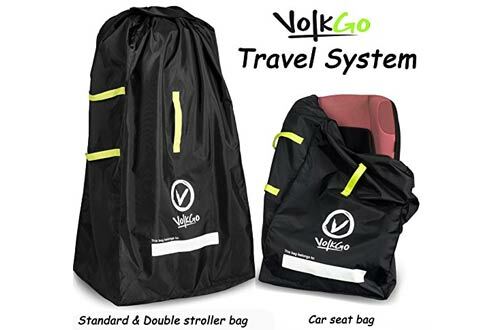 For those of you looking for universal car seat travel bags, you can relax since this model is designed to suit all your needs. 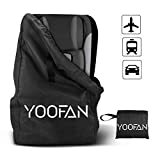 This travel bag is made using the best quality waterproof materials that ensure the best protection from scratches, dust, and germs. 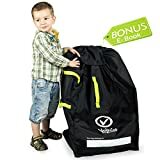 It is a perfect choice for any parent who would want to get a well-padded travel bag that carries their kid’s car seat conveniently. Traveling for long distance with your kid is already stressful, but this doesn’t mean that you have to leave your adorable kid behind. The BOOBAALOO Car Seat Travel Bag takes into consideration of the users need, ensuring that you can travel with your toddler conveniently. 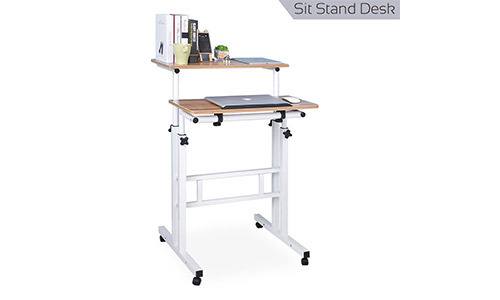 Regarding the kids and parent comfort, this unit comes with an adjustable shoulder strap that offers the kids enough support while ensuring the mother’s comfort. 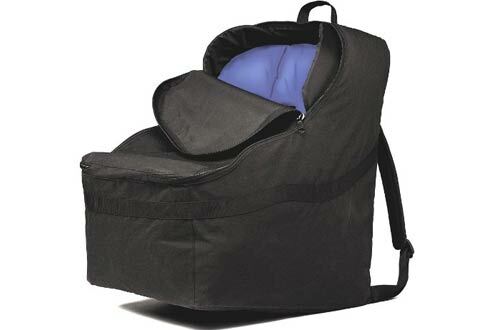 This is another impressive car seat travel bags that boasts of incredible colors. 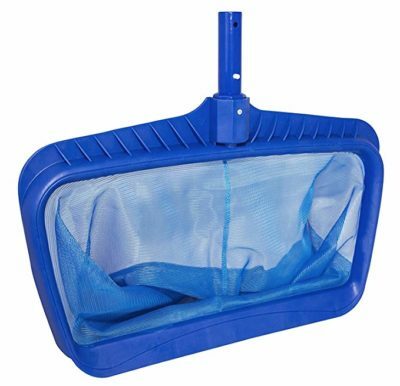 Besides its stunning colors, we love it’s water-resistant, durable and double layer fabric that not only ensures the protection of the car seat when traveling but also when in storage. It also comes with a large yet customizable design that will fit the most boosters, strollers, and infant carriers. 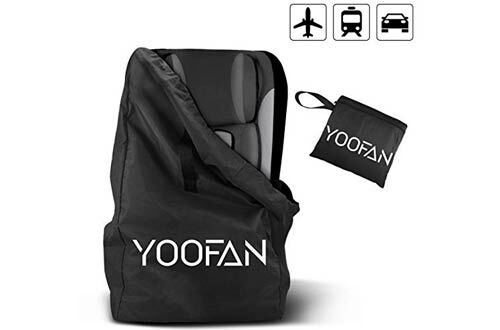 You can bring this bag confidently for car seat gate checking when getting on an airplane. 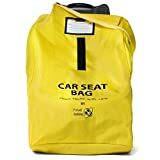 Besides allowing that the car seat is free from dust, germs, and other contaminants, you can carry it to the passenger’s area in an airport without having any charges imposed on your luggage. 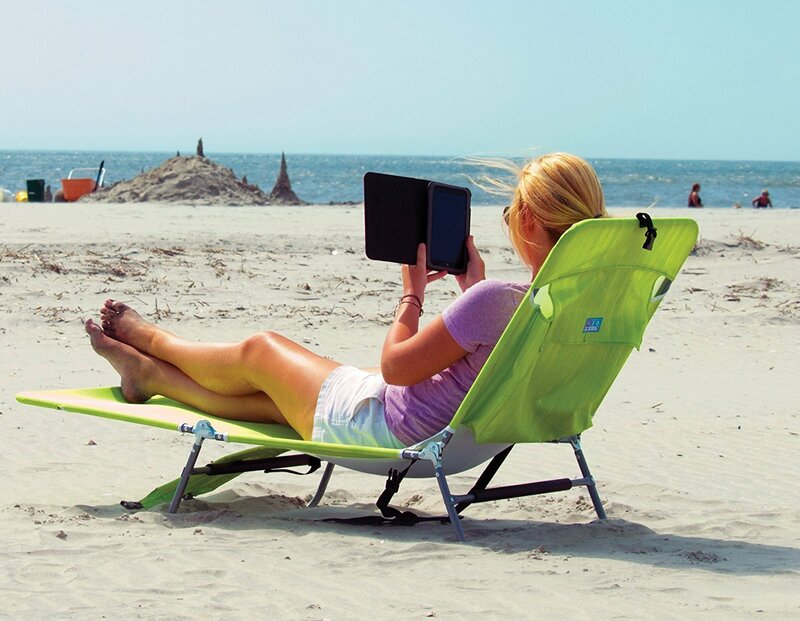 What’s more, this unit has padded backpack straps that allow you to carry it just the way you like.